70% of the public want president Abbas to resign while 26% want him to remain in office. Three months ago, 67% said they want Abbas to resign. Demand for Abbas’ resignation stands at 64% in the West Bank and 80% in the Gaza Strip. Three months ago demand for Abbas resignation stood at 60% in the West Bank and 80% in the Gaza Strip. If president Abbas does not nominate himself in a new election, 35% prefer to see Marwan Barghouti replacing him, while 22% prefer Ismail Haniyeh; Mohammad Dahlan 7% (1% in the West Bank and 15% in the Gaza Strip); Mustapha Barghouti (5%); Rami al Hamdallah (5%), Khalid Mishal (3%), and Salam Fayyad (2%). Level of satisfaction with the performance of president Abbas stands at 31% and dissatisfaction at 66%. Level of satisfaction with Abbas stands at 36% in the West Bank and 22% in the Gaza Strip. Three months ago, satisfaction with Abbas stood at 31% (38% in the West Bank and 21% in the Gaza Strip). If new presidential elections were held today and only two were nominated, Ismail Haniyeh and Mahmoud Abbas, the former would receive 53% and the latter 41% of the vote (compared to 50% for Haniyeh and 42% for Abbas three months ago). In the Gaza Strip, Abbas receives 33% of the vote (compared to 36% three months ago) and Haniyeh receives 66% (compared to 62% three months ago). In the West Bank Abbas receives 47% (compared to 45% three months ago) and Haniyeh 43% (compared to 42% three months ago). If the competition was between President Abbas from Fatah and Mustafa Barghouti from al Mubadara (Initiative), the two receive an identical percentage of 45%. Mustafa Barghouti receives 57% of the vote in the Gaza Strip and 36% in the West Bank and Abbas receies 39% of the vote in the Gaza Strip and 50% in the West Bank. Vote for Mustafa Barghouti is higher in the cities (48%) compared to villages and refugee camps (33% and 44% respectively), among the religious (50%) compared to the unreligious (36%), among supporters of Hamas and third parties (87% and 80% respectively) compared to Fatah supporters (16%), among those whose age is between 18-22 years (55%) compared to those whose age is over 50 years (38%), among refugees (56%) compared to none-refugees (34%), among holders of BA degree (49%) compared to illiterates (2%), among students, merchants, and retirees (66%, 55%, and 54% respectively) compared to the unemployed, employees, and housewives (34%, 40%, and 43% respectively), and among those who work in the private sector (46%) compared to those who work in the public sector (35%). If presidential elections were between three: Mahmud Abbas, Marwan Barghouti and Ismail Haniyeh, Abbas would receive 18%, Barghouti 41% and Haniyeh 36%. If presidential elections were between two: Marwan Barghouti and Ismail Haniyeh, Barghouti receives 58% and Haniyeh 37%. If presidential elections are held soon, 42% want Hamas to nominate one of its leader while 45% prefer to see Hamas supporting a third party or an independent candidate. Only 34% of the Palestinian public say people in the West Bank can criticize the PA without fear; 61% of the public say that people cannot criticize the PA without fear. Positive evaluation of conditions in the Gaza Strip stands at 5% and positive evaluation of conditions in the West Bank stands at 12%. Perception of safety and security in the Gaza Strip stands at 53%. In the West Bank perception of safety and security stands at 45%. Three months ago, perception of safety and security in the Gaza Strip stood at 49% and in the West Bank at 50%. Findings show that the percentage of Gazans who say they seek to immigrate to other countries stands at 41%; in the West Bank, the percentage stands at 22%. Three months ago, 43% of Gazans and 22% of West Bankers indicated that they seek to immigrate. Perception of corruption in PA institutions stands at 77%. 81% want the reconciliation government to pay the salaries of the civil employees of the former Hamas government but 14% do not want it to do so. Similarly, 81% of the public want the reconciliation government to pay the salaries of the security sector employees of the former Hamas government and 14% do not want it to do so. 78% support placing the police department in the Gaza Strip, which is currently under the control of Hamas, to come under the control of the reconciliation government so that the police departments in the West Bank and the Gaza Strip would come under the one command and control center; 19% are opposed to that and prefer to maintain the current status quo. Now that it has taken control of the border crossings and the headquarters of the ministries and other public agencies, 38% are satisfied and 55% are dissatisfied with the performance of the reconciliation government. Satisfaction is higher in the West Bank (41%) compared to the Gaza Strip (33%), in villages and towns (45%) compared to refugee camps and cities (34% and 37% respectively), among women (37%) compared to men (32%), among the unreligious (45%) compared to the religious and the somewhat religious (37% each), among Fatah supporters (61%) compared to supporters of Hamas and third parties (25% and 33% respectively), among the non-refugees (41%) compared to the refugees (35%), among the illiterates (43%) compared to those who hold a BA degree (31%), among the retirees (50%) compared to the farmers, merchants, and students (19%, 27% and 35% respectively), and among those who work in the public sector (41%) compared to those who work in the private sector (35%). 50% are optimistic and 45% are pessimistic about the success of reconciliation. Three months ago, optimism stood at 31% and pessimism at 61%. Despite the rise in optimism, only 43% expect the reconciliation government to take real control of the security conditions in the Gaza Strip; 47% do not expect that to happen. In this context, 45% of the public believe that the latest factional meeting in Cairo has been neither a success nor a failure while 19% view it as a success and 27% as a failure. 78% support the formation of a national unity government composed of Fatah, Hamas, and other faction while only 17% prefer to keep the current reconciliation government. If a national unity government is established, the public is divided over its peace program: 43% want it to adhere to Abbas policy but 49% does not want to do so. Support for the adherence to Abbas policy is higher in the West Bank (48%) compared to the Gaza Strip (35%), in villages and towns (48%) compared to refugee camps and cities (40% and 42% respectively), among women (45%) compared to men (41%), among the unreligious and the somewhat religious (50% and 47% respectively) compared to the religious (38%), among Fatah supporters (76%) compared to supporters of Hamas and third parties (19% and 38% respectively), among those whose age is over 50 years (44%) compared to those whose age is between 18-22 (34%), among none-refugees (48%) compared to refugees (38%), among the illiterates (58%) compared to those how hold a BA degree (35%), among housewives and employees (46% and 44% respectively) compared to students and merchants (29% and 37% respectively), and among those who work in the public sector (48%) compared to those who work in the private sector (40%). Responding to Abbas’ call for “one government, one gun,” 72% want the armed groups that belong to the various factions in the Gaza Strip to remain in place and only 22% support disbanding them. Support for keeping the armed wings is higher among the religious (79%) compared to the unreligious and the somewhat religious (52% and 67% respectively), among supporters of Hamas and third parties (88% and 78%) compared to Fatah supporters (49%), among holders of BA degree (69%) compared to the illiterates (59%), and among those who work in the private sector (73%) compared to those who work in the public sector (61%). Only 43% believe that the date set for elections in the latest factional meeting in Cairo is appropriate while 33% think it is late and 16% think it is too early. 70% support holding legislative and presidential elections but only after resolving all remaining issues such as control over security, PLO, and the armed factions; 26% support holding elections immediately, without resolving these other issues. The largest percentage (45%) believes that the reason behind Abbas’ decision not to remove the sanctions he had imposed on the Gaza Strip is to pressure Hamas to make more concessions that would remove the obstacles to reconciliation. On the other hand, 22% believe that he has not removed the sanctions in order to insure a slow process of reconciliation and 23% think he seeks to bring about the collapse of the process of reconciliation. 51% support and 38% oppose the resignation of the reconciliation government led by Rami al Hamdallah if it does not immediately remove the Abbas-imposed sanctions on the Gaza Strip. Demand for the resignation of the Hamdallah government is higher in the Gaza Strip (59%) compared to the West Bank (47%), in refugee camps (60%) compared to villages and towns (44%), among men (53%) compared to women (50%), among the religious (56%) compared to the unreligious and the somewhat religious (49% and 48% respectively), among supporters of Hamas and third parties (73% and 61% respectively) compared to Fatah supporters (30%), among refugees (55%) compared to non-refugees (48%), among holders of BA degree (55%) compared to illiterates (45%), and among those who work in the private sector (51%) compared to those who work in the public sector (46%). For the next three months, the top priority of the reconciliation government in the eyes of 42% of the public should be the delivery of electricity and water to Gazans on daily basis while 30% believe it should be the opening of the crossings, 10% think it should be the resolution of the problem of the payment to the employees of the former Hamas government, 9% believe it should be the holding of elections, 6% the imposition of control over security matters in the Gaza Strip, and 2% the convening of the existing Palestinian Legislative Council. For the next year, the top priority of the reconciliation government in the eyes of 41% of the public should be the opening of the crossings; delivery of electricity and water to Gazans on daily basis (31%), while 11% think it should be the holding of elections, 7% think it should be the resolution of the problem of the payment to the employees of the former Hamas government, 7% believe it should be the imposition of control over security matters in the Gaza Strip, and 3% the convening of the existing Palestinian Legislative Council. 51% believe that the reconciliation effort is not linked to the restoration of negotiations and the peace process while 43% think that it is indeed linked. 24% think Fatah and Abbas came out of reconciliation winners and 20% think Hamas came out a winner. But 48% believe that Fatah and Hamas have come out neither winners no losers. With regard to regional players, the largest percentage (51%) believes that Egypt came out of reconciliation a winner while only 34% described Saudi Arabia as a winner (and 25% as a loser), 33% said Qatar came out a winner (and 26% as a loser), and 27% said Iran came out a winner (and 26% as a loser). Although 33% characterized Israel as a winner, 46% characterized it as a loser. 91% characterize Trumps declaration recognizing Jerusalem as a capital of Israel as a threat to Palestinian interests (79% as a great threat and 12% as a limited threat) while only 7% saw no threat in the declaration. The largest percentage (45%) believes that the most appropriate Palestinian measure against the US step is to stop all contacts with the American Administration, submit a formal complaint to the International Criminal Court (ICC), and resort to an armed intifada. But 27% think it should stop the contacts and submit a complaint to the ICC, but should resort to non-violent resistance. Still, 12% want the PA to only denounce the US step and stop the contacts with the US Administration and an identical percentage wants it to denounce the step while maintaining contacts with the US toward reaching a permanent peace. Support for stopping contacts, submitting a complaint to the ICC and resorting to an armed intifada is higher in the West Bank (48%) compared to the Gaza Strip (40%), among men (48%) compared to women (43%), among the religious (47%) compared to the unreligious (34%), among supporters of Hamas and third parties (58% and 50% respectively) compared to supporters of Fatah (36%), among holders of BA degree (45%) compared to the illiterates (37%), and among farmers and students (85% and 51% respectively) compared to housewives and merchants (41% and 42%). However, only 27% of the public believe that the Palestinian leadership will actually stop contacts with the US, submit an ICC complaint, and resort to an armed intifada while 24% believe the PA will denounce the US step but will maintain contacts with the Trump Administration. The largest percentage (44%) believes that armed resistance is the most effective means of establishing a Palestinian state next to the state of Israel while 27% think negotiation is the most effective means and 23% think non-violent resistance is the most effective. Three months ago, only 35% indicated that armed resistance is the answer and 33% sided with negotiation. Support for armed action is higher in the Gaza Strip (47%) compared to the West Bank (42%), in cities (45%) compared to villages and towns (37%), among men (47%) compared to women (40%), among the religious (49%) compared to the unreligious and the somewhat religious (32% and 40% respectively), among supporters of Hamas (67%) compared to supporters of Fatah and third parties (20% and 38%), among refugees (47%) compared to non-refugees (41%), among the illiterates (48%) compared to holders of BA degree (44%), and among farmers, merchants, and students (72%, 52%, and 46% respectively) compared to housewives and professionals (40% and 42% respectively). An overwhelming majority of 72% believes that the Trump Administration will not submit any ideas or plans for Palestinian-Israeli peace while 24% think it will do so. But even if the US does submit a peace proposal, an even larger majority of 86% believes that such a proposal will not meet Palestinian need to end occupation and build a state; only 11% think the proposal will indeed meet such needs. Nonetheless, 49% believe that president Abbas might accept the American peace plan if one is indeed submitted to him while 42% believe he will not accept it. Belief that Abbas might accept the US proposals is higher in the Gaza Strip (62%) compared to the West Bank (41%), in refugee camps and cities (55% and 51% respectively) compared to villages and towns (39%), among supporters of Hamas and third parties (65% and 53% respectively) compared to supporters of Fatah (43%), among those whose age is between 18-22 years (50%) compared to those whose age is over 40 years (47%), among refugees (53%) compared to non-refugees (45%), among holders of BA degree (54%) compared to illiterates (45%), among farmers, professionals, and students (63%, 56%, and 53% respectively) compared to retirees, laborers, and housewives (40%, 45%, and 47% respectively), and among those who work in the private sector (49%) compared to those who work in the public sector (46%). When asked about the Israeli side, 65% said that they think the Israeli Prime Minister Netanyahu will accept such American peace plan; only 26% think he will not accept it. Moreover, 72% of the public believe that major Arab countries such as Egypt and Saudi Arabia (or at least one of them) will accept this American plan if submitted; only 20% think they will not accept it. Regarding public trust in the roles and positions of major Arab countries in the peace process and the US efforts to develop a regional agreement in the context of Palestinian-Israeli peace, an overwhelming majority of 82% says that it does not trust the Saudi role, 75% do not trust the Emirati role, 70% do not trust the Egyptian role, and 59% do not trust the Jordanian or the Qatari roles. Moreover, 76% say the Arab World is too preoccupied with its own concerns, internal conflicts, and the conflict with Iran and that Palestine is no longer the Arab’s principal or primary issue or cause. Only 23% think Palestine remains the Arab’s principle cause. In fact, 71% believe that there is already an Arab Sunni alliance with Israel against Iran despite the continued Israeli occupation of Arab land while 21% believe that the Arabs would not ally themselves with Israel until it ends its occupation and allows the creation of a Palestinian state. Three months ago, only 64% said that an Arab Sunni alliance already exists with Israel. 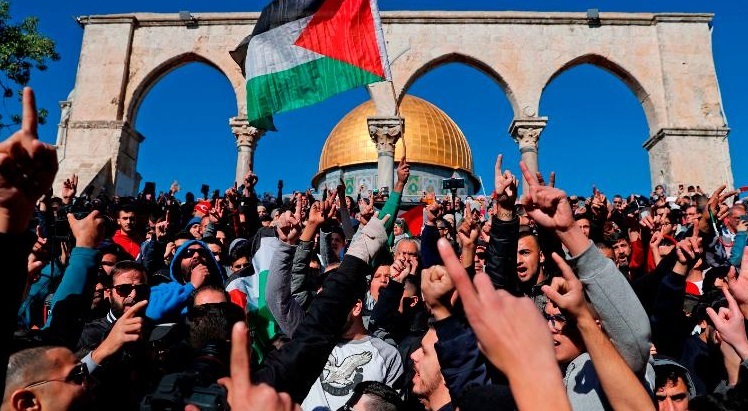 48% believe that the first most vital Palestinian goal should be to end Israeli occupation in the areas occupied in 1967 and build a Palestinian state in the West Bank and the Gaza Strip with East Jerusalem as its capital. By contrast, 28% believe the first most vital goal should be to obtain the right of return of refugees to their 1948 towns and villages, 14% believe that it should be to build a pious or moral individual and a religious society, one that applies all Islamic teachings, and 9% believe that the first and most vital goal should be to establish a democratic political system that respects freedoms and rights of Palestinians. The most serious problem confronting Palestinian society today in the eyes of 29% of the public is the continuation of occupation and settlement activities while 26% say it is poverty and unemployment; 20% say it is the spread of corruption in public institutions; 17% say it is the siege of the Gaza Strip and the closure of its crossings; and 4% say it is the absence of national unity.